Headlight kits often come in various shapes and sizes and it’s easy to get overwhelmed by the huge amount of those products. One moment you see an HID kit, and the other you see a LED kit. This can be a little confusing for potential buyers, so they often seek a budget solution that offers the most for the price. As I am not a fan of any expensive product, I always seek to look for a solution that gives me an excellent bang for the buck. One such product caught my attention and it comes straight from Xentec’s woodworks. The star of the show today will be Xentec HID Headlight Kit. 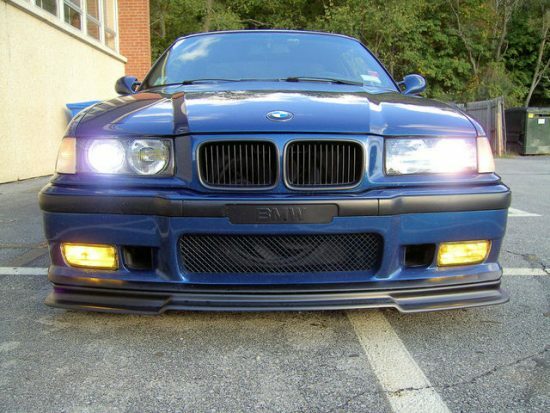 Headlight kits are awesome if you want to take your car’s presence and beauty to a completely new level. And you know what? They are cheap and affordable, just like Xentec HID Headlight Kit that goes all-guns-blazing with its powerful HID bulbs. If the penetrating light of Xentec HID bulbs doesn’t make your saliva dripping from your mouth, then I don’t know what will! Guys and girls, brothers and sisters, this is a great time to take a much closer glance at Xentec HID Kit, so let’s do this. 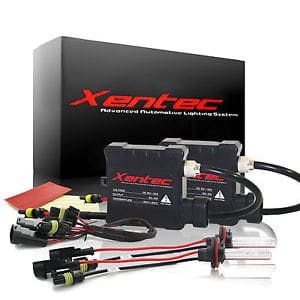 What makes the Xentec HID Headlight Kit Special? When I first received my box of Xentec HID Kit, I was in doubt if this is really the kit I’ve ordered. It’s light as a feather with its 10.4 ounces and the box is just plain small. What kind of sorcery is this? Fortunately, Xentec is no magician, so no tricks this time and not candies them. This black box is indeed very compact, yet packs all the necessary stuff needed for the installation. We have two ballasts, 2 HID bulbs, 2 sets of connection cables, 2 foam application pads and 1 instruction sheet here. Quite frankly, I found this kit a tad harder to mount and install, as it took me nearly half an hour to get it finished. Furthermore, the ballast in this kit is very compact, which is nice and cute from an aesthetics standpoint. However, I don’t like the material used here and it seems quite weak at first touch. Aside from plastic ballasts, there are insulated connection cables. This insulation will grant a much higher reliability and durability of your cables. The only downside here is that they need to be assembled. Oh, have I forgotten to tell that instruction sheet offers a ZERO info about the assembly? Yeah, it’s pretty much a fraud and it’s not done in a way that’s informative and useful. You can use it as a toilet paper after a poop. On the brighter side, Xentec HID Kit comes with a plethora of colors to choose from. The basic, Iceberg Blue color, comes with 8000K of color temperature which sounds impressive on the paper. Aside from that color, we have a green, pink, blue, yellow and many other variations of colors. I’d say this is a pretty good offer at this price ($37.99). Xentec HID Headlight Kit comes equipped with H11 Xenon bulbs by default, but you can also choose from the other headlight sizes. Sure, most modern cars come with H11 bulbs, but then, not everyone has the cash to buy a new car, and I’m very glad that Xentec thought about it. With a slightly bitter taste in my mouth, I’ll take 100% water and shock resistance as a sweet candy that mildly washes away this taste. When it comes to the overall power, we are dealing with the 35 W bulbs, so nothing too exceptional here. On the paper, you should receive the performance which is quite below the average for this price range. At least, we have Alloy Casing with sealant for a “complete” protection against the bad conditions. HID bulbs located in Xentec HID Headlight Kit are three times brighter than the ordinary halogen lights. This will ensure that the road ahead of you is always bright and vivid. This headlight kit is compact, weighing 10.4 ounces. The transportation and portability of this kit are simply top-notch. Due to its Alloy Casing with sealant, Xentec HID Kit is always well-protected and kept from bad conditions such as dust and vibrations. 35% less power consumption will assure that you always waste less electricity. Available for every bulb size, including the basic H11 size. HID bulbs are an excellent addition to this kit. They are three times brighter than halogen bulbs, offering 35% less power consumption. Their lifespan is also a couple of times greater. 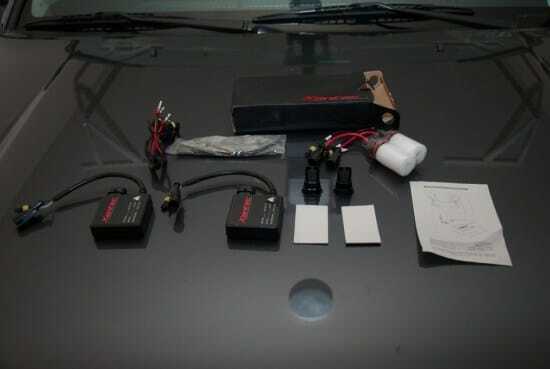 Xentec HID Kit comes in various colors, meaning that you can always change the color efficiently. The installation of every kit is completely identical. Plug & play connectors are always a welcome addition. You can now relatively simply install this kit and enjoy what it has to offer. It’s 100% shock and water resistant. Compact ballasts will easily fit into tight spaces. A budget-friendly solution for users with a humble wallet. Regarding of the color choice, the HID bulbs in this kit are somehow underwhelming. They aren’t that bright and they’re definitely below average. The instruction sheet in the package gives almost no info about installation. Although we’re talking about plug & play connection, this kit doesn’t seem so simple to install. 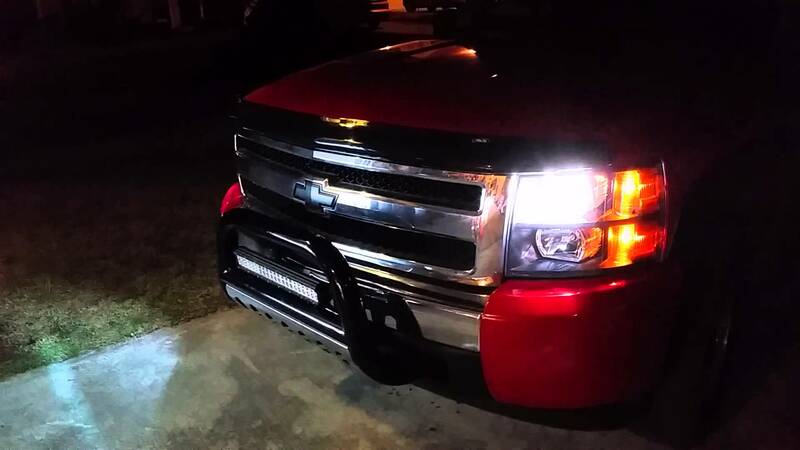 It’s a budget solution, but you can find a much cheaper headlight kit with much better performance. 2 ballasts are compact, with a not-so-great durability. Its plastic material doesn’t do any good either. I’m very disappointed with the overall build quality. Connection cables still need to be assembled, so we aren’t talking about real plug & play. Xentec HID Headlight Kit is a tiny, compact and affordable headlight kit for your car. But, from our Xentec review, it’s clear that it still isn’t worth a buy. As a fan of budget-oriented headlight kits, I can assure you that you can still get a better buy for the same price and I’m very disappointed with what this product can offer. For the start, you get HID bulbs that will save some energy and provide you with a “piercing” ultra blue lights. That’s all on paper, but in reality, Xentec HID Kit speaks a completely different story. Even if you are a beginner, this kit will give you headaches when you try to install it, so I wouldn’t recommend it in that case. On the other side, HID kits enthusiasts will be disappointed with its low-grade bulbs and lackluster performance. I would buy a Kensun HID kit over this one, even though its price is slightly higher. Save yourself some cash and skip this product.